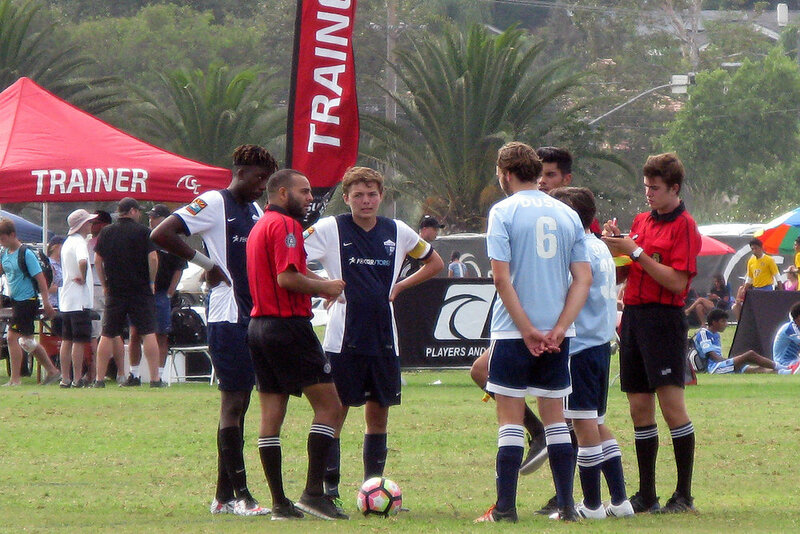 This August, Coach Alex Cuba’s DUSC Blue team traveled to San Diego to compete in the Surf Cup, one of the country’s toughest and most prestigious tournaments. Their trip, a DUSC swan song for some, combined sun and surf with the soccer. Off-the-pitch highlights included the beach, the San Diego zoo, an Italian meal overlooking the Pacific and a Mexican meal serenaded by mariachis. The players’ favorite, however, was SoCal standard In-and-Out Burger, which they visited on their return trip to the airport. At the Surf Cup, the team played in Men’s U19, “up” a year for most players. It was a tough bracket. After one win and one tie, they lost to Diablo FC from Contra Costa, CA— a team rated 19th in the nation — and were eliminated. Below is Coach Cuba’s perspective, inspiring to players on any team. A soccer player’s ability on the field is quantified by how good their control of the ball is, their ability to pass the ball accurately, their speed of play, their ability to put the ball in the back of the net or their ability to keep the ball out of the net, and so on. The one trait that is never on the stat sheet — the one characteristic that is hardly mentioned when measuring a player’s ability to play at the next level — is their heart. In my opinion, a player’s intestinal fortitude is what separates the great players from the average. As I looked out onto the field at the Surf Cup, this past season, this past year, I saw my DUSC U17s take the field and play their hearts out, over and over again. I would look out onto the field and be literally amazed on a game-by-game basis, by how hard they were willing to work for one another, by their effort to ensure that they were there for one another, or by their lack of fear of any opponent or moment. I looked out onto the field and saw a field of giants. I looked out onto the field with great pride at being associated with this group of extraordinary young men. Success in sports is often measured by wins and championships. I admit that I am guilty of constantly measuring my own success as a coach and as a player by how many Ws my teams put up. This is simply my competitive nature and my natural disdain to losing in any form of competition. I have always wanted all my players to experience success the way I did during my younger playing days because the memories of those championships last for eternity. It was no different for this current group of boys. In fact, I don’t think I have ever wanted a group of my players to win and achieve success more than these boys. In my speech at the end of the tournament, after being eliminated by a very talented team, I did what any coach that cared would do. I tried to console my boys and tell them that they gave everything they had and that’s all we can ask from them. Due to me being a player still, I knew those words would not ease the pain of being knocked out of the tournament they worked so hard for. We went on and enjoyed the rest of our trip, but the fact that once again we came up just a couple minutes short of winning and advancing still lingered inside me. During one of our many talks, my brother, whose opinion I value and cherish, told me he was proud of the job I had done with this group because of the camaraderie they had, the heart and desire they played with and how they enjoyed playing for me. That resonated with me quite a bit. But it wasn’t until the flight home that I realized we did it. We were successful!! Two years ago this team came to me with just a simple desire to play the beautiful game of soccer believing that they were just another group of friends getting an opportunity to play together for the fun of it. Fast forward to the Surf Cup and this is now a team with a determination to reach the highest level they could possibly reach, an insatiable desire to be the best team they could be and ambitions to one day be called a champion. They not only want to be a called a champion one day but now they expect it. It is with great humility and gratitude that I say to you, my boys of the DUSC U17 Blue, Thank You!! Thank you for an incredible weekend! Thank you for an incredible season! Thank you for an incredible year! Thank you for inspiring me to want to be better simply by your desire to want to be the best. To Mert, David, Liam and Danny – while you are moving onto your next stages in life, know that you have left your imprint in my life and I hope I have left mine in yours. Good luck to you!